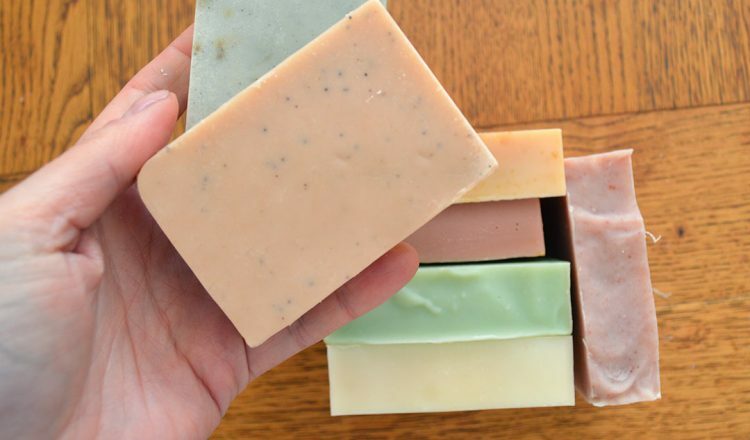 Easy soap recipes that are simple to make and use all natural ingredients. This is part three of the Natural Soap Making for Beginners Series. In the first two parts of this series I introduce you to common soap making ingredients. You’ve also learned about the equipment you need to make soap and safety precautions. Now it’s time to get to the fun part — making your first batch. 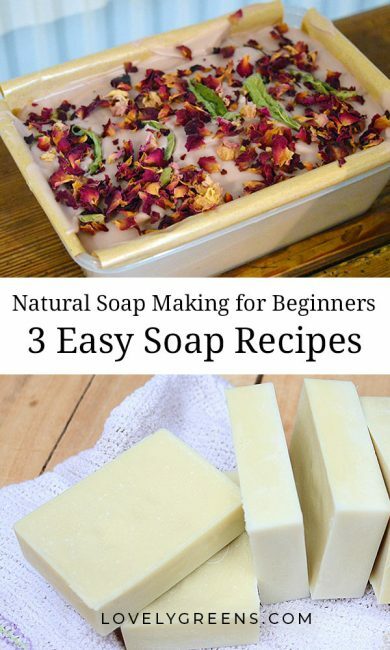 This piece shares several easy soap recipes including a simple flower soap, a simple herbal soap, and a 3-Oil soap recipe for those of you wanting to save a little dosh. Many of the soap recipes I share on Lovely Greens are for 1-lb (454g) batches. These are GREAT for beginner soap makers because they’re small and thus inexpensive to make. Many recipes you’ll find online or in books will be for larger batches but making six bars at a time is plenty. It gives you room to learn to make soap without the world ending if you mess up. Best of all, making one pound batches is great for trying lots of recipes rather than just one big one. If you like any of my recipes and in the future want to make more, rest assured that they can be doubled and tripled. You could even make a lot more than that at a time. For now, keep it simple and small scale. There are several options open to you for 1-lb soap molds. First off, the recycled route. The mold you’ll see in the Simple Flower Soap is a plastic take-away container. Its the same kind that your rice or noodles arrives in when you order take-out. Line the insides with baking paper, shiny side up, and pour your soap in and it will fit perfectly. The overlapping flaps of paper will help you to lever it out when it’s time to un-mold. You can also use a standard size paper milk carton. Rinse it out and open the top — no need to cut it open. Pour your soap in that top opening, allow it to harden into a block. After a couple days simply rip the paper carton off your soap to get it out. You can chop it into bars afterwards. Lastly, I can recommend this six-bar silicone mold. It’s one that I use regularly and again it will fit 1-lb batches perfectly. The added benefit of silicone molds is that they last a long time and the bars they produce look really professional. Plus the bars come out without needing the additional step of cutting. One thing that I really would like to emphasize is that beginners should use tried and tested recipes. Just like a beginner baker will use an existing cake recipe, so too should you use recipes that have already been formulated. Creating your own is far more complicated than just throwing a bunch of oils together and pouring in lye-water. There are all kinds of things to consider that you really don’t need to think about just yet. I’m giving this bit of advice based on experience. At the beginning of my own soap making journey I had a grand plan to make my own recipes from the get go. What a disaster. Batches didn’t firm up, the bars I produced weren’t hard enough, and weird things kept happening. If I weren’t so stubborn I’d had given up. You’re going to be smarter than me and stick with recipes you know will work. That way, you’ll be pretty much assured of success. If anything does happen, you’ll also know that it’s probably down to human error rather than the recipe. It gives you a good starting place when trying to trouble shoot. I’ve shared a few recipes for you to begin with below. The directions on how to make these recipes can be found in the next part of this series. I go through the ins and outs of soap making with you and illustrate the process with quite a few photos. All three of the below recipes should be made at around 110°F (43°C) and can be gelled by insulating. Gelling the soap is optional though and you’ll read about what it is and how to do it in the next part. For even more soap recipes for beginners check out my other recipes. Most include individual instructions geared for that particular recipe. I also have many palm-oil free soap recipes and an article on why I support the use of sustainable palm oil. 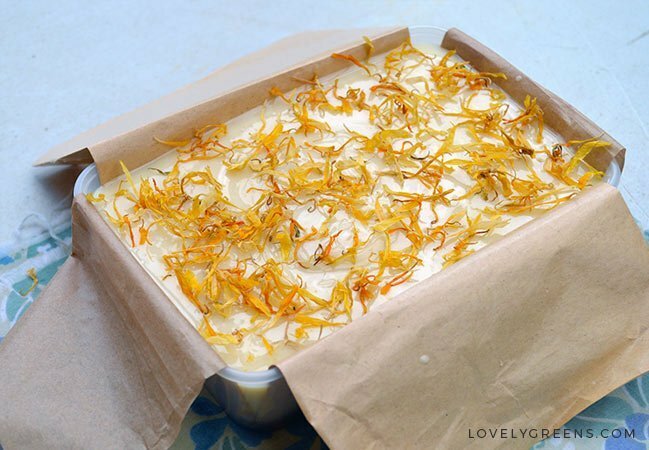 I give in-person soap making lessons here on the Isle of Man and most people end up making a variation of this recipe. It’s palm oil-free and uses oils that will create a good hard bar with plenty of bubbles and moisture. The recipe can be customized to include the floral essential oil of your choice and I give several examples. The 14g of essential oil is based on essential oils that have a 3% usage rate in soap. If you’d like to use a different essential oil with this recipe then please check it against this essential oils for soap making chard. Although optional, a cosmetic clay can give a really lovely shade to your bars. The type used in the photo is rose clay but you can get clays in many different shades. Use the basic soap making instructions along with these additional steps specific to this recipe. * Mix the clay and water up before you begin making soap. Add it to the melted oils by pouring through a sieve/strainer. Cosmetic clays come in a range of colors including blue, green, pink, and brown. Here are various natural soap making colorants to give you inspiration. ** You may use a maximum of 3 tsp of essential oil total in your soap choosing from these scents: chamomile (Anthemis nobilis), lavender (Lavandula augustifolia), neroli, palmarosa (Cymbopogon martini), rose geranium (Pelargonium graveolens), or ylang ylang (Cananga odorata). *** Dried flowers are a pretty way to decorate handmade soap but unfortunately they can turn brown on contact. Calendula petals will stay yellow but for others there are two options. You can lightly sprinkle them on once the soap has firmed up slightly. The parts that don't come into contact with the soap will stay colored, at least for a while. The other option is to wait until your soap is fully cured. After the 28 day waiting period, spray your the areas you want flowers on your soap with witch hazel or denatured alcohol. Sprinkle the dried flowers on top and wait for the alcohol to dry. When it's fully dry, the flowers will be adhered to the soap. Neat huh? 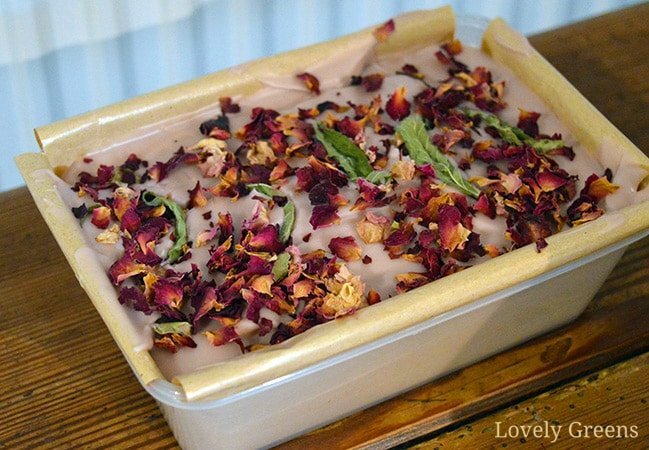 Decorate your soap with rose petals, lavender buds, calendula petals, dried chamomile, and other skin-safe dried flowers and leaves. If you grow your own herbs, this could be the recipe for you. You can use your own chopped mint, lemon balm, or other herbs in combination with a zesty blend of herbal essential oils. 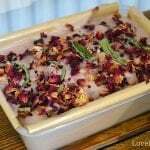 This recipe also only uses four main soaping oils so it will be less expensive to make than the floral soap. Although you could potentially customize the blend of this too, I’d advise caution. Many herbal essential oils are safe to use in making handmade soap including rosemary, peppermint, lavender, and marjoram. Some are less safe though so either stick with the amounts and types in trusted soap recipes or do your research. 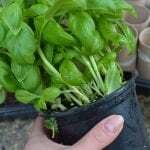 * For your finely chopped herbs I'd recommend to use 1 teaspoon fresh or 1/2 tsp dried. 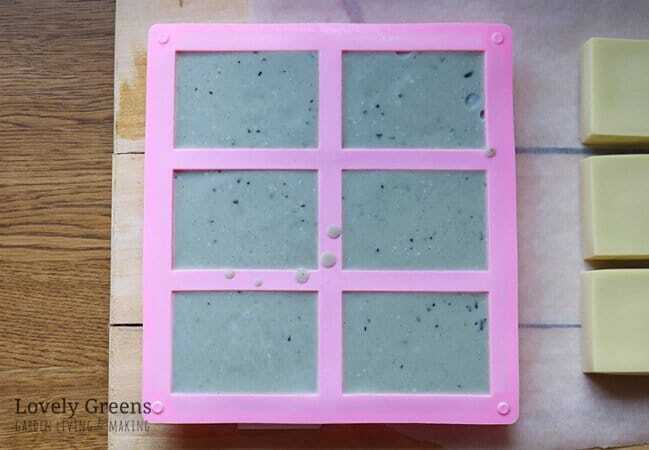 The herbs add speckles through the soap but no noticeable scent. This one is for those of you who want an easy, sensitive, and inexpensive soap recipe. There are only three main oils and no additional colors or scent to add. It’s also very gentle on your skin and can be used by the entire family including those who have skin issues or very delicate skin like babies. Although the other two soap recipes don’t include palm oil, I’ve introduced it for this one for three reasons. First of all it creates a good hard bar with plenty of lather. Secondly, even the most expensive palm is less expensive than most other oils. The last reason is that I strongly feel that all of us, including soap makers should support the Sustainable Palm oil industry. It’s very controversial and confusing but I’ve written a piece on why boycotting palm oil could threaten the environment even more than using it. Saying that, ALWAYS make sure that the palm oil you’re using has RSPO certification. Dirty palm oil is killing the rain forests and no amount of soap can wash your hands clean of that. Please ensure that your palm oil is certified by the RSPO as being sustainable. *You may use pomace olive oil or extra virgin olive oil (evoo) for the 'Olive oil' ingredient. EVOO will result in soap that is more yellow in color. I just happened to stumble on your website. I love your recipes and video on soap making. Do you have any video and recipes on making soap using a soap base? You are amazing, love your recipes.thank you so much for sharing you soap recipes with us .i have tried some of them and soaps turned out amazing.im in love with your blogs. 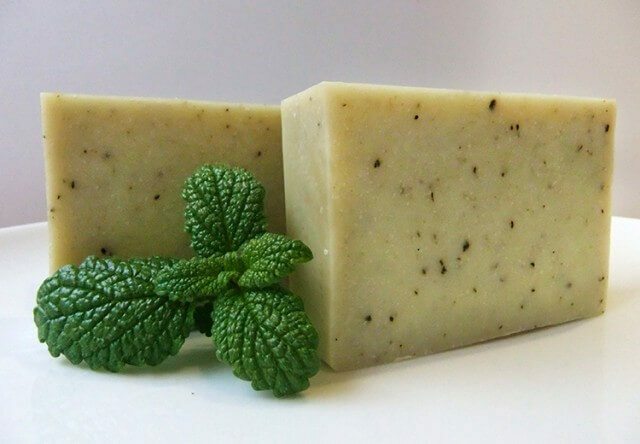 I was wondering if i could still add some essential oils to this simple 3 oil soap recipe? I have a question, I love your Lemongrass recipe! Can I just exchange the colour and the essential oils and use and repeat the recipe? would it work for any other as well as with the lemongrass. just starting making soap so all just a bit new to me! I am very new to soap making but I have already experimented in making my own cosmetics and I regularly make my own lip balms for myself and presents. I already have a few supplies and organic oils and essential oils. I would love to try a soap recipe with using what I already have. I looked into buying Grapefruit Seed Extract to make the “Herbal Soap Recipe” but it seems quite expensive. Is this essential oil interchangeable? Or is it recommended in this recipe because it has certain properties to make this a successful soap? Could I switch it for organic peppermint essential oil for example? I will follow the rest of the recipe accordingly 🙂 Thank you for any feedback (and thank you for so many amazing recipes & lots of info on here!). Thank you! I think I have read your blog in it’s entirety this week – I absolutely love it! I also saw that you had mentioned that GSE is very helpful to keep soaps from going rancid 🙂 I found it cheaply online in the end. I have been eager to make soaps for years but I moved around often so I never got all the materials together. 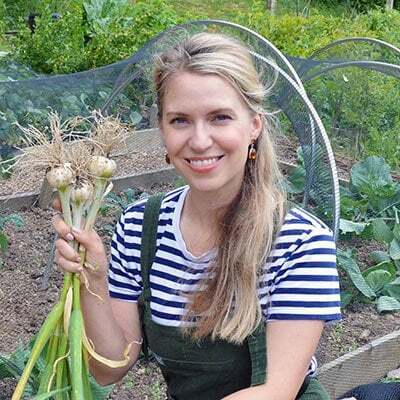 Now I have relocated from Canada to southern France and have a wonderful garden going and your blog matches my lifestyle very well! I also worked with an alternative art supply company and have lots of left over natural mineral pigments that I can finally put into use 😀 I had bees last year (sadly they were attacked and didn’t survive) but I look forward to having a well-rounded lifestyle where I can mix my interest in crafting things, gardening, and animals/bees. I am pretty obsessed with my dehydrator and have been drying everything I can get my hands on – including lots of wild flowers. I am pretty surrounded by wild flax and elderberry in my area, I am curious if anyone has tried either of those out in soaps? I also think Alkanet may be in my area so I need to explore that option for dyes too! Anyway – a big thank you for sharing your wealth of information (I am not a blog person at all normally!) but found all your blog posts super, super helpful. I’m just waiting for a few oils to arrive in the mail and ready to get soaping! Your new life in France sounds amazing Lisa! Enjoy every moment of it 🙂 Sorry to hear of your bees — was it the asian hornet that attacked them? Also I’m VERY jealous that you may live in an area where Alkanet grows. Is it on a commercial scale? Happy soaping! Thank you for sharing your knowledge! 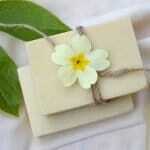 I am thinking about trying to do soaps for myself and your page is full of valuable information. Thank you! Thanks. I am from India (Tamilnadu). The scent of oils stays in the finished soap recipe. You can use sesame seed oil but do take this into consideration. You can’t use it as a replacement for any soap recipe either — you have to create one specifically for the oils you’re using. if I put caustic soda in the soap does it stop being vegan? Caustic soda isn’t made from animal products so it’s Vegan. Superfat can be a difficult idea to understand, especially in the SoapCalc. All it means is the percentage of oils that exceed the amount the lye needs to be completely used up. Any or all of the oils in your SoapCalc recipe can be your superfat. There are at least two ways to go about creating a superfatted soap. The first is to expose ALL the oils in your recipe to the lye solution. What happens in this case is that a proportion of each of the oils you use will end up staying in your bars as unsaponified oil. If you want a particular oil to be your sole superfat, then you hold back the oil until the very end. That way, the lye interacts with the oils you want it to, and when you pour your superfat oil in at Trace, it will stick around without turning into soap. Hope this explanation helps. Thank you very much, Tanya, for your explanation. As for first way i understand. As for second if am whrite understand when i make a recept in calculator i put 7% “superfat” for example and after i start preparation i separated these 7 % particular oil and add them just in trace? Thank you. It’s entirely up to you if you want to separate 7% of your oil out and add it at Trace. If you do, the chance that these oils will stay in your soap as the superfatting oil is higher. If you put all your oils in the pan before the lye-solution (so before before you even start stick blending) then your superfat in your final bars will be a little of each oil from your recipe. Does this make sense? Thanks, Tanya, for the useful tips! Tanya, thanks for this very comprehensive and useful article. Can I make a half recipe to begin with? First of all, because I’ve never made it before. Also, will a half recipe reduce my stirring time to reach ‘trace’? I’ve not yet bought a stick blender. Another question — can I use ALL palm oil? Because, where I live (India), olive oil is expensive, and the coconut oil is not deodorised — I don’t like that strong smell in soap. I don’t mind if the bar is hard from using just palm oil — I’m thinking of adding some orange zest to it. As for half recipes — yes you can. Be prepared to stir by hand for at least an hour to hit trace though. I just made my second batch of soap: Coconut, olive, shea butter and castor oil. Upon rereading your website I realized I needed to also add an antioxidant. Will my soap go rancid? It will probably be fine Marlene. A lot of soapers don’t use one at all but I’d recommend that you use your soap within a year to make sure your extra oils don’t go off. 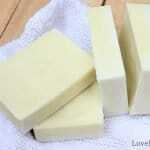 Hi Tanya, I want to try making a basic soap but I can not understand how to use the lyecalk’s ? I want to make a small amount . I have coconut oil, caster oil and olive oil my lye but no idea what quantities to use . Please help , Julie. Hi Julie! You can play around with the soapcalc but a good recipe might be 30% coconut oil, 60% olive oil, and 10% castor oil. Pop those into the calc and give it a 6% superfat. Once you have the percentages in, click the radio button on the other side of the percentages column — it will be lbs, oz, or g. Then at the top under number 2, select your preferred value and put the total weight of the batch size you want to make. Press ‘Calculate Recipe’ then ‘View/Print Recipe’ to see your recipe. Love all the information in your blog. Starting my own adventure in soap making. For the calendula soap, when do you add the Shea butter – at the beginning with the ‘hard’ oils or after trace ? It’s entirely up to you! 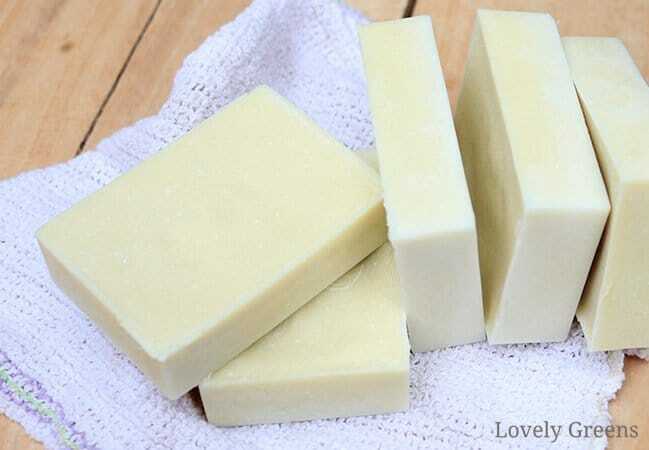 If you put the shea butter in with your hard oils then your soap will have a superfat of all the oils in your recipe. If you add the shea after Trace then it’s more likely that it’s the shea butter that superfats your soap. Thank you so much for all the information! I love your nature oriented life style and admire you for it. I was wondering if the soap recipes can be doubled or tripled. Thank you! Thank you Diana 🙂 In regards to doubling or tripling batches — absolutely. Just be aware that the tracing time will take a little bit longer with larger batches. Also, I’d recommend that the soaping temperatures are dropped about 10 degrees F if you’re using larger moulds. Sorry, I forgot to ask, I have a silicone mould with individual soap cubes, and I noticed you advised someone to use a higher temperature (55C/130F) with this type of mould but with using honey in the recipe I should stick to lower temperatures. What do you think would be best? Thanks again! 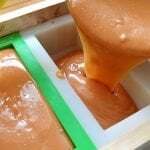 When you have sugars in your soap recipe (like honey), your soap will naturally become hotter once its poured into the moulds. Stick with cooler soaping temperatures when you’re working with sugars. I fortunately had my soap recipes certified before it started getting too expensive. These days yes, it can be pricey depending on how many variations you have in mind. The best advice I can give you is to get in touch with a reputable EU certified chemist and get a quote. Your website is a fantastic resource for us soap makers. Thank you for being so generous in passing on your knowledge. I have a question that follows on from this query. 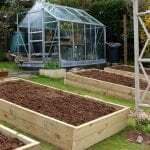 You use (I think) herbs and flowers you have grown in your garden. 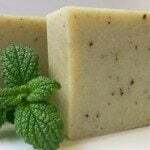 I am applying for the certificates for my own recipes, but am wondering how I can use the herbs from my garden and sell the soap, and abide by the EU regulations when the products won’t have the relative MSDS and allergen certificates etc. I know it’s a long shot to ask you, but how did you go about that? Thanks again for an amazing web site. I get lots of inspiration from it! I’m sorry if I’m repeating a question from earlier … what is the shelf life for homemade products? If you’re selling it, your shelf-life will be the expiration date of the oil you’re super-fatting with. If it’s just for home use, then there really isn’t a general one in my opinion. Soap stays soap a long time and though the fragrance might fade, the soap will still clean 🙂 Saying that, if it smells strange, has weird growth on it, or is generally icky then don’t use it. Keeping soap stored in an airtight container will help prolong its life/scent too. Thank you so much for these priceless information!!? great resource. thank you. I have a question. I am unable to find palm oil . Do you know if there is a substitute in your lavender soap recipe? This is a wonderfully well written and researched series of articles. Just what I was looking for. Thank you! Is Sodium Hydroxide (Lye) also called caustic soda? I’ve found your soap making tutorial and am going to give it a go! The only thing I am confused about is the oils in making my own recipes. I have the soap calculator and the 3-4 oils I want to use, but I don’t understand how to decide the % of oils to use. Is there a guideline as to which solid or liquid oils need to be in %? And does this include the superfatting oils? That was also one thing I didn’t understand – in the soap calc, it asked for the super fat %, but I am hung up on how to figure out how much of each oil to use! I’ve chosen coconut, olive, sunflower and either shea or cocoa butter but am unsure of how to figure out the amounts to use of each. Any tips would be greatly appreciated!!! deciding which percentage of oils to use – experienced soap makers will know this but your best bet is to think olive oil first, then coconut, then other oils. Those first two will make up the bulk of most soap recipes. You’re going to have to play with the calc to get a good result though. Superfat oil – this is an area that the soap calc does need work in my opinion. What I do is take the percentage of oil that I want superfatted out and set that aside. For example if you’re making a 800g batch and your superfat is 6% then choose the oil you want (shea butter for example) just use 48g of it at the end. Or if there isn’t 48g of it in your recipe, just set what you have aside for the end. The lye can only combine with so much oil so whatever is left after will superfat your bars no matter if you add it in with the lye or at the end. The reason you would set aside a specific superfat oil for the end is to stop it from combining with the lye and becoming soap itself. You could use purple mica as well but be careful about the proportions. You might need less than the amount listed for the ultramarine purple so I’d recommend you do a test batch(es) first. Hurrah! I have now made 4 batches of soap and am well on my way to being dangerously addicted 😉 Christmas presents are sorted for this year haha! I’m just struggling to get my head around a couple of things. Firstly, I bought a silicone mould with 12 individual bars instead of a loaf, and am struggling to get it to gel. Either that or I’m just not recognising gel when I see it. I’m wrapping it up with 3 or 4 towels and heating the oils & lye to 45C. Ought that to be hot enough for individual moulds? I also have a question about trace. It seems different soapmakers have preferences as to whether they blend to light, medium or full trace before pouring. I am just wondering what difference this makes to the final soap? Does a lighter trace mean longer setting/curing time, or does it make no difference? Thanks again for your wonderful wealth of knowledge 🙂 If I lived in the UK I would so come to one of your classes!! Gel with individual soap moulds – you’re probably going to need to use a higher temperature (55C/130F) for mixing and then pop them into a well insulated box wrapped with towels. If you have a wooden box that the mould and towels will fit in, all the better! I have been reading your 4 part series and noticed where you mentioned antioxidants you mentioned using either Grapefruit seed extract or rosemary oleoresin extract, however in all the recipes it lists using vitamin E or Grapefruit seed extract. Is vitamin E an acceptable antioxidant to use and can you use the powdered form or liquid form? Vitamin E is also an antioxidant so you can use it as well. Use a high quality liquid form – many bottles of inexpensive Vitamin E are mainly carrier oil and contain very little of vitamin e.
Thank you so much! I have decided to try my hand at soapmaking and this info is by far the best and most informative that I have found. I have a lot of frozen goats milk that I would like to use in my soap. I do not want to use Palm oil or Tallow. I would like to stick with coconut oil, olive oil, shea butter, beeswax and goats milk. Is this doable? What are your suggestions? I’d use the Soap Calc to see what it says but your ingredients will work. Note that you should only use a tiny amount of beeswax in your recipes (only 1-2%) and that the goats milk should be added to the lye in your recipe slowly and in its frozen state. How Can I replace shea butter if it isn’t available for me ? Place the recipe into the Soap Calc tool mentioned in the post, make note of all the figures for ‘Soap Bar Quality’ then edit the recipe to your heart’s content. For the honey and beeswax recipe, when should the beeswax be added? Is it melted with the other oils or added separately? I think I’ve seen some instructions that it is melted separately and added after lye and oils are combined? You can add it with your other oils to melt down or afterwards – either works. If you add it afterwards though, there’s a higher chance of the beeswax not saponifying and staying in your bars as-is. Personally I think adding the wax during the melting phase is better since beeswax is better used to harden bars rather than moisturise the skin. Other ‘superfatting’ oils like shea butter and cocoa butter are better to add at the end. Hi Tanya. 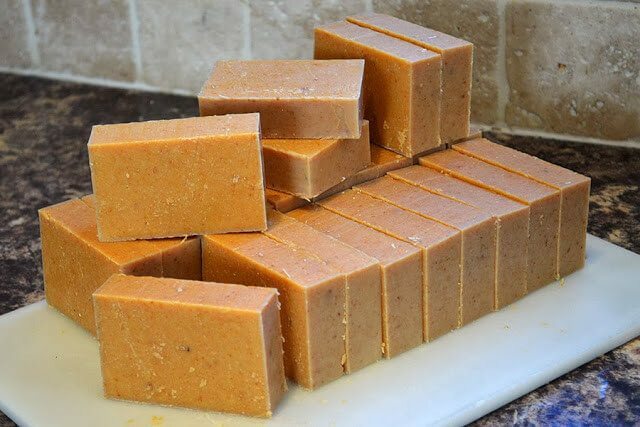 I have just made the honey and oat soap you have posted in this page. I only realised toward the end, that I had mixed all the oils together, instead of leaving the superfatting oil aside to mix at light trace. So for next time which is the superfatting oil and what are your thoughts on 10% superfatting? Hey Tanya, thank you for the info, your posts have been so valuable on my soaping journey! 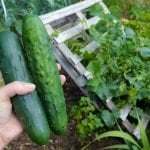 I noticed the links on this post are broken, any idea on where else to get the information you were trying to share because I am about to try to create my first recipe and i need all the help i can get! Thank you in anticipation of your response. Hi Deenie and thanks for the heads up on the links! This is very informative for any kind of DIY products. I was wondering if anyone can shed some light, suppliers do not list that the stock is food safe, but things like cacao butter should be edible also correct? I can’t find any info on that and it would be nice to get everything at once! Also, Saffire Blue has become less reputable over the years but I hear good things about Candora Soap. Hi There! Lovely post! I've been making soap for about a year and a half now, and I've been using a wire multi-cutter, which leaves bumps and grooves on my soap. 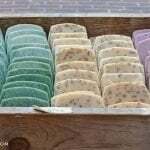 What kind of mold and cutter do you use to achieve the clean edges of you natural lavender soap above? Thanks! Can I substitute extra virgin olive oil for regular olive oil in these recipes? Hi, this blog of yours it's awesome. You explain so clearly and i just want to thank you for sharing. I'm a beginner at soap making, and all your advices aré really useful. Hi Tanya! I'm making soap for the first time this winter and just wanted to run my recipe by you to see if you have any advice you could offer. I have been living in South Africa for the past year and so was thinking of using rooibos tea in place of the water, pairing that with orange essential oil. I was thinking of using coconut (60%) and olive oil (35%) as the bulk oils, with cocoa butter as the superfatting oil (5%). Would you recommend different ratios in the oils? Thanks so much for your advice! I've made several attempts to research soap-making, and your tutorial is the most balanced and practical that I've found. I have a crazy question for you. My six-year-old and I collected a bunch of acorns, and on a whim I decided to make flour with them – which involved leaching the tannin from the nuts first. I boiled down the water into a concentrated tannin-rich solution. I'm working to perfect a recipe that uses this solution in place of water. I'm hoping the tannin-rich solution will produce a soap that will be cosmetically beneficial. Have you ever tried anything similar, or heard of anything like that? Could all my work be for naught – for instance, could the heat of the production process render the tannins ineffective? I have over a gallon of the tannin solution, and would like to justify its presence on our countertop to my wife…. And thank you for all this great information on your site! May I ask a question about the soap calculator on soapcalc.com? how do you figure out step 2, the weight of the oils? I tried to use this two weeks ago and botched it. I don't get it. Tanay – What does it mean Coconut oil 76 degrees / 92 degrees and fractionated? I just order a tub of coconut oil – and have no idea what it is? WOW- so much great information. This is just what I needed to dive into soap making. I would love to link to this post if you didn't mind. You are doing such an amazing job with this series!! So thought out and so fantastically written. Such a great resource! Forgot to click the NOTIFY button. LOL. Thanks for the tutorial and can't wait for the rest. This is so great Tanya. Are you do soap making gift sets in your shop?? Would make wonderful presents with just the right amount of everything for people to have a first try and making soap. I have bookmarked it, I have some fat stored and some that needs rendering as well. I am not going to attempt the wonderful bar that you sent me but just want to do something simple at first. I will start getting stuff together. Animal tallow can directly replace palm oil in a recipe (for you Sunnybrook and for those reading the comment above). It has the same soapmaking properties and palm is often referred to in soapmaking as vegetable tallow. Olive oil pomace is chemically produced. Might want to look into that. It’s extracted using a solvent but the end product is pure oil. Personally I like to see all of the olive oil from a harvest used – waste not, want not – and keep EVOO for preparing food. Can I sub caster oil instead of Palm oil? Good question. I'd be interested to hear the reply.